How long does it take to get to the Dry Tortugas? Getting to the Dry Tortugas on the seaplane takes about 40 to 45 minutes. How can I get out to the Dry Tortugas? 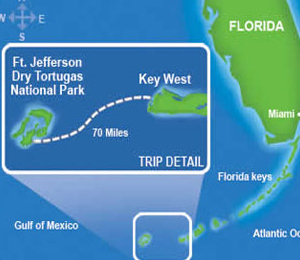 Located about 70 miles off the shores of Key West, the Dry Tortugas are only accessible via a plane or boat. Should I make my reservations ahead of time? Definitely, the Dry Tortugas are the most popular Key West destination. Especially on weekends, special events and holidays, bookings do fill up completely. Unfortunately, the islands are not handicap/wheelchair accessible. Is fishing allowed on the Dry Tortugas? Due to the fragile nature of the islands as well as their status as a preservation site, fishing is not allowed on Garden Key. Can I go scuba diving in the Dry Tortugas? There are no charters that are able to provide guests with scuba diving trips.